The finished result of a glazing technique is a glassy transparent glaze which is resistant to surface cracks and stains. 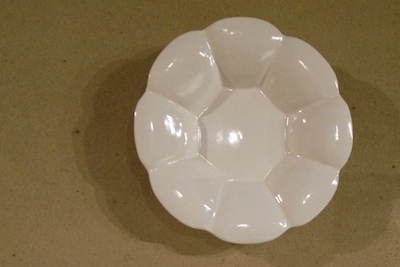 Pottery with this glaze has a smooth surface, minimizing cutlery noise. On the other hand, the mat glaze is made by degrading the quality of a transparent glaze. Examined under a microscope, the surface of the mat glaze is uneven, causing louder cutlery noise and making it more susceptible to staining. However, it is the uneven surface which makes this pottery artistic and interesting. Even if the pottery gets lightly stained at the beginning of its use, continuous usage allows the stain to meld into the glossy coating of the overall surface, only adding to the interest of the piece. 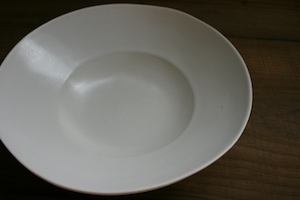 If you wish to remove a cutlery scratch from white pottery, it can be sanded off with No. 300 or equivalent sandpaper. However, this kind of pottery does not lend itself to use with knives and forks. 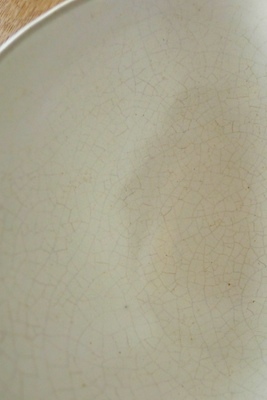 The different rate of shrinkage during firing between a piece of unglazed pottery and the glaze causes tiny cracks in the glaze which are called ‘crazing’. Pottery with such crazing may sometimes get stained. The amount of crazing determines how much staining appears. Such stains can add to the overall “interest” of the piece, but may also be the cause of mold. The traditional precaution for using such pottery is boiling it in water that was used to wash rice before using it. This treatment is effective in preventing stains and mold, and is useful with pottery made of coarse-grained soil. However, it shouldn’t be necessary to do this with my pottery, as it is made from a very fine-grained soil, and is designed to have as little crazing as possible and is unlikely to develop mold. I want you to be able to use the piece right away without any extra bothersome steps. Some people appreciate the stains in the crazing as an additional nuance, but other people consider it as a defect. It’s a matter of personal taste. If you are really bothered by the stains in the crazing after you use my pottery, please get in touch with me at the gallery and I will replace it for you. Silver can be overglazed again at a later time. With my ‘silver overglaze series’, sterling silver is fired directly onto the pottery. It may get blackish when it has not been used for a while, or after use with wet foods or eggs boiled in hot springs. This blackish matter is harmless and is just a sulfide film which occurs when silver combines with hydrogen sulfide in the air. To get rid of it, polish the area with dampened fingers and baking soda, or a cloth with silver polish (or toothpaste) on it. Even though it’s pottery, treat iｔ in the same way as you would a piece of silver jewelry. Using it often helps prevent the chemical reaction and keeps it in its original condition. If the silver overglaze should somehow come off, it is possible to reapply the silver and fire it on again for an additional charge. 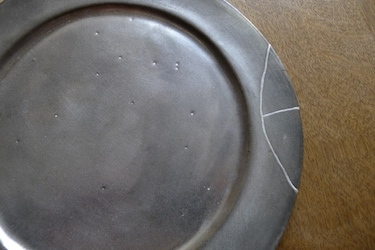 Do not put wet foods on the silver plate for a long time. Do not put eggs boiled in hot springs. Please refrain from using a microwave or wire wool. At the beginning, a drying towel may get blackish with powder made by polishing silver. The powder will soon disappear. With the black glaze, adding various ground metals such as iron or manganese to the glaze causes a chemical reaction which creates different variations of color. Like the transparent or white glaze, the black glaze also has variations from mat to gloss. For my pottery, I use two kinds of mat glazes, the black-green glaze with a greenish nuance and the black rust glaze with which gold colored crystals are generated. 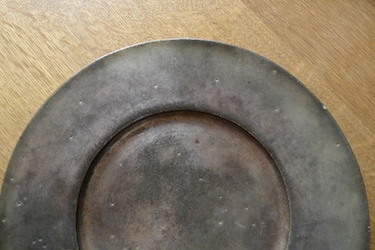 As a characteristic of the mat glaze, the oil content from your fingers or food may remain on the surface and look like a stain at the beginning. However, daily use of the pottery will coat the entire surface with an overall glossy coating and will make the stain unnoticeable. If you would like to get rid of the stain sooner, you can apply olive oil or other cooking oil over the entire surface to artificially make a glossy coating. Metallic crystals may appear on the surface of the black rust glaze and turn your drying towel blackish at the beginning, but they are not harmful and will soon disappear. 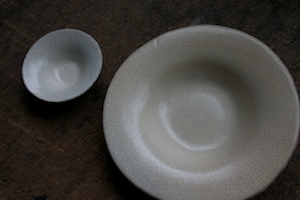 I hope you will use my pottery as your daily tableware.